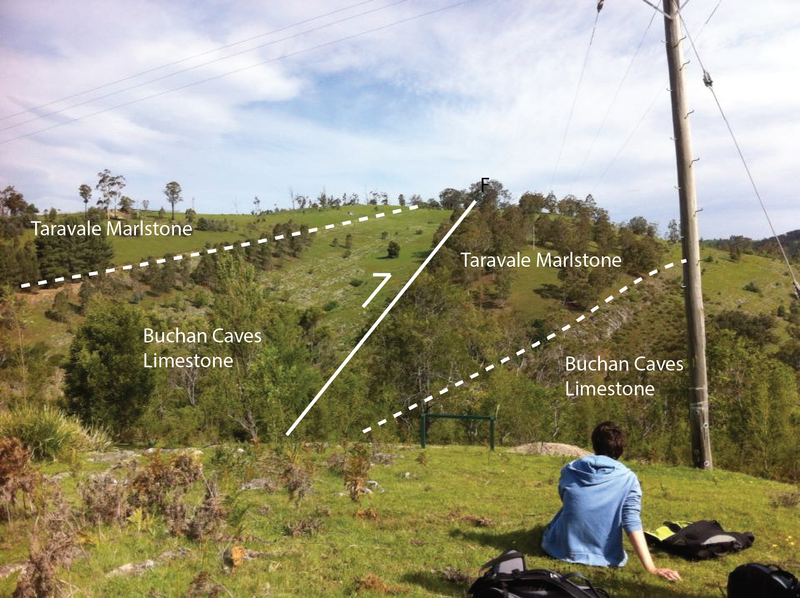 Buchan, a township located in the Shire of East Gippsland 350km east of Melbourne, Victoria is an area of great geological significance in the context of Gondwanan Tectonics during the Palaeozoic. The area lies within the Lachlan Fold Belt which, 500 Ma years ago, was a region of active land accretion (i.e. a lot of Victoria was still submerged beneath the ocean!). The large folded structure in the map below is called the ‘Murrindal Synclinorium’. This is essentially a fold more than 5 km across which, due to significant outcrop at the surface, allows us to understand what was occurring in Victoria during the Lower Devonian. Figure: Simplified geological map (click to enlarge) of the Buchan region with the main caving locations as well as main roads. The cross-section A-A’ shows my rough interpretation of the Murrindal Synclinorium. The Snowy River Volcanics (420 – 493 Ma) is the lowest and oldest layer (the brown in the map above). It indicates – with outcrops of a mixture of rhyolitic to andesitic lavas, agglomerates and tuffs – the eruption of several volcanic centers into an extensional basin (i.e. like filling in cracks). Photo: Outcrop of Snowy River Volcanics. Photograph taken in creek bed east of McLarty’s Ridge (private land). The Spring Creek Member (tiny bit of red to the NW on the map above) directly overlies the volcanics and marks a period of significant erosion and re-working of the lavas (very lenticular, i.e. non-continuous). Following this quiet period, it is thought that the area was suddenly (geologically speaking) inundated with water (i.e. local transgression) as evidenced by the transition to the marine Buchan Caves Limestone (orange above). Initially unfossiliferous, the deepening water gradually improved living conditions, allowing spiriferoids, rugose corals, brachiopods, nautiloids and oostracods to move in (the blue in the map above). Photo: Crinoid fossils of the Buchan Caves Limestone. Photo taken at Potholes Reserve. 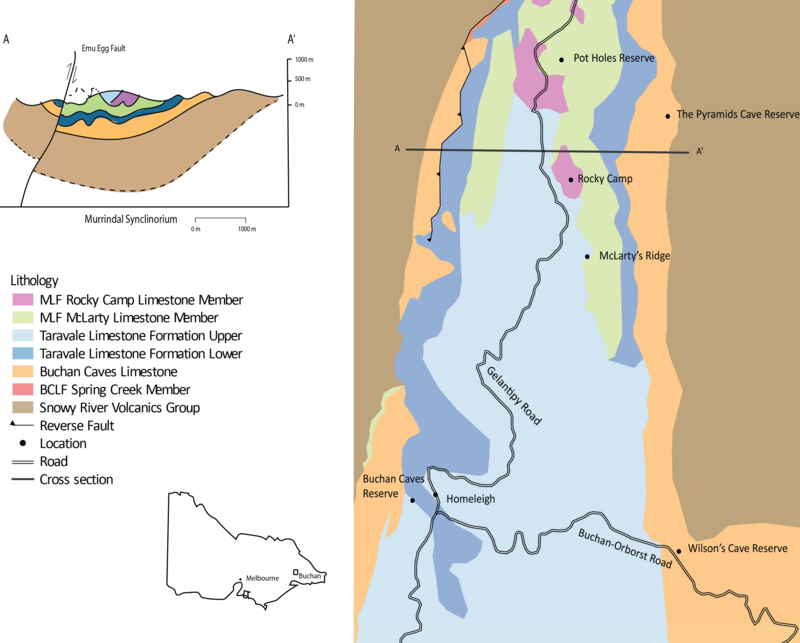 The Murrindal Limestone Formation (green and purple above) reflects the continued deepening of the water and establishment of open shelf conditions. Sedimentation soon became calcerous (i.e. lots of dead marine life), with localized reef bioherms developing on the edge of the shelf and a community of brachiopods, trilobites, nautiloids, favosites, stromatoporoids, receptaculites and crinoids establishing itself on the gentle slope (Potholes Reserve! Keep a keen eye out on the surface and you’ll see these fossils everywhere). Photo: folded (anticline) limestone layer. Photo taken on the roadside north of Buchan looking south. All of the folding and faulting which created the huge structure pictured above as well as the image above occurred much later during the Middle Devonian Tabberabberan Orogeny (i.e. big compression event which affected most of Victoria. It’s like when you push both ends of a rug together and create bumps). Potholes Reserve (ref. map) is a really good location to explore the limestone formations and find fossils (above and below ground!). Pictured below is a ‘Splay Fault’ off the main fault called Emu Egg Fault (ref. map) which can be viewed on a hill-side above Fairy Cave in the Buchan Caves Reserve. Many grassy views along the road side conceal the large open folds (they just require a careful look), and many road cuttings similarly (especially near Buchan Caves Reserve) preserve the sedimentary successions (even trilobites have been found here!). A lot of the localities I had access to were unfortunately on private land (second year University field trip), however the public reserves provide more than enough stimulus to get a feel for the geology. Some of Buchan’s best features are better viewed beneath the surface. A number of people (including myself!) have been fortunate enough to explore the renowned caves. Karst areas including Buchan, East Buchan, The Basin and Gelantipy are the best locations for caving. Some of these locations are provided on the geological map above. Photo: Entrance to Wilson’s Cave, accessible from roadside. Photo: Me inside Wilson’s Cave. It can be a bit squeezy! ‘The Potholes Reserve’ at Murrindal is littered with 100s of caves, almost all of which are no-permit caves. These include: Jam Pot, Honeycomb, Oolite, Razor, Centipede and Baby Berger. Wilson’s Cave (East Buchan) and Slocombes Cave (The Basin) are two more caves which do not require permission. Visiting caves on the Buchan Caves Reserve (i.e. Dukes Cave, Moon Cave and Whale Cave) requires a permit form Parks Victoria. Photo: Inside Honeycomb Cave. Photo credit: Caitlin. I went caving with an organised University group of experienced cavers, something which I’d recommend for first-timers. Homeleigh is a big old (~ c. 1885!) low-cost accommodation ‘homestead’ style house for cavers located in Buchan. Run by volunteers, rooms can be booked for caving trips by anyone and used as a base for day trips. Very nice blog post. I definitely love this site. Keep writing!